Rosetta's ROSINA instrument tests the waters in Comet 67P's atmosphere; Using the sun to make clean water; Messages behind coral reef acoustics; Ice with holes in it. Where did water on Earth come from? While no consensus has been reached yet, some scientists think asteroids or comets could have brought it here. 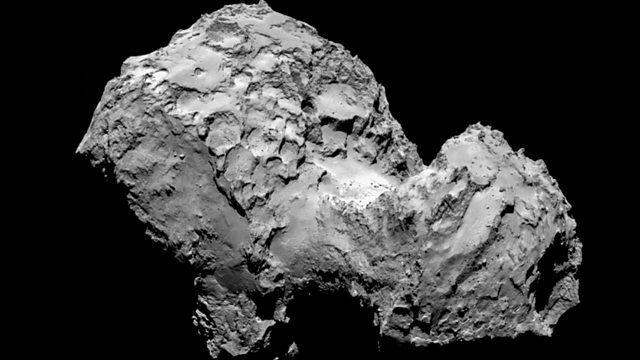 Circling Comet 67P on board Rosetta is the ROSINA instrument – it is measuring the ratio of heavy hydrogen to light hydrogen isotopes of water in the atmosphere surrounding this now famous comet. By testing this ratio, it can be compared to the water on Earth to determine if comets like 67P could have delivered water to our planet. Science in Action hears ROSINA’s recent results from professor Kathrin Altwegg from the University of Bern, who is the instrument’s principal investigator. Professor Ian Wright of the Open University in the UK and principal investigator on another Rosetta mission instrument, Ptolemy, comments. According to the United Nations 1.8 billion people will be living in regions with absolute water scarcity by 2025 – access to clean drinking water is and, seemingly will be, crucial. One solution to areas that do not have good freshwater supplies is to use seawater, which has to be run through a desalination process to get the salt out of it. However, traditional methods used to do this are expensive, sometimes inefficient and rely on fossil fuels. Now a British-based company has developed the Desolenator – a device that is the size of a flatscreen TV, which harnesses the power of the sun to desalinate salty as well as dirty water and provide enough drinking water a day for a family of six. William Janssen, CEO and inventor of the Desolenator told Science in Action how it works. Coral reefs are amongst one the noisiest environments on the planet and healthy reefs can be heard using underwater microphones from kilometres away. However, new research illustrates that reefs damaged by human impact such as overfishing and landscape development are much quieter than their healthy counterparts. A quieter reef can spell danger for young, larval fish and crustaceans that use sound as a critical homing beckon. Dr Julius Piercy from the University of Essex in the UK led the research and tells Science in Action what listening to a reef can tell us about the biodiversity it harbours. In some parts of the world this Christmas, we will be seeing ice on the ground. Ice is an unusual substance – it comes in a number of alternative forms because the water molecules that make it up can be packed together in many different ways. Recently, scientists have found yet another way in which ice can be structured. Roland Pease investigates.